They record what's ahead. Sometimes they record what's behind. Most mark it with GPS (or what's the point?). This is exactly what you need on the mean streets of modern life. Dash cams are already essential in many countries because of scam artists who try to create accidents so they can sue you. They’ve also proven useful for catching cars flying into buildings, or the occasional meteor, as happened in Thailand and in Russia, all thanks to dash cams in the right place at the right time. But while auto con artists aren’t as common here, recording your excursions is a reasonable precaution to take—especially if you’re driving professionally. And even if you’re not, you may unexpectedly appreciate using it to chronicle your vacation travels—or tap into your smart home, as we recently tested with an Alexa-enabled dash cam, the Garmin Speak Plus. March 22, 2019: We just reviewed Z-Edge's T4 dash cam (available on Amazon), which kind of broke our hearts because it's almost the full package. It offers impressive design and construction, including a 4-inch touchscreen and an easy interface. It sports high-resolution 1440p front and 1080p rear cameras, both of which record some of the best video we've seen. We also like the parking mode, which turns on the camera if something (like a thief or a bumper-basher) trips its g-sensor. But it doesn't have GPS, and that's a bummer. Read our full review. The Viofo A129 Duo dual-camera system produces high-quality day, night, and low-light video from both its front and rear cameras, and it does so for a good price. Better still, its supercapacitor will take video for 2-3 seconds after a power failure. Aside from an overly thick cable to the rear camera, we have no complaints. The A129 Duo is easily our favorite budget dual-camera dash cam (available on Amazon), with superior 1080p day and night video from both the front and rear cameras. It holds its own against far more expensive duos from Thinkware and Blackvue. Aside from the somewhat unwieldy rear cam cable, it’s all goodness, all the time. Read our full review. 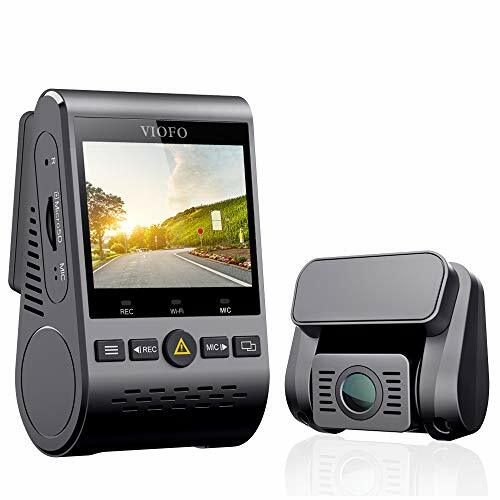 Even adding the $50 optional GPS mount the CDR895 is a good deal, with dual-channel versatility, great daytime video and passable nighttime video. The CDR 895 D Drive HD is by far the cheapest dual-camera system we’re aware of (available on Amazon), even when you add $50 for the option GPS mount. Its controls and interface are top-notch, and day video from the 1080p/160-degree front camera is excellent. For all the details, read our full review of the Cobra CDR 895 D.
Everything about the 612GW. including the touchscreen and 4K UHD day video is top-notch. Everything that is, except the low-light video which is weak. With the headlights on, it's fine, but you can say that of many dash cams. A great camera for many users, a non-starter for some. The 612GW (available on Amazon) made quite the impression with its touch display and extra-detailed 2160p video. It’s a fantastic dash cam overall, though the inferior low-light captures will be an issue for some. Read our review. Garmin’s Speak Plus dash cam (available on Amazon) deserves mention because it’s the only dash cam (other than its predecessor, the Garmin Speak) that can be controlled using Amazon’s Alexa smart assistant. You can also, of course, ask Alexa to do other things around your home while you’re in the car. You’ll need to keep your smartphone handy to enjoy all the features, though. Read our full review. The Vantrue OnDash N1 Pro (available on Amazon) is our new favorite low-cost dash cam. It’s compact, light, relatively inexpensive, takes good video under all conditions, and has a real battery to keep running if the 12-volt fails. Because we recommend GPS for legal and travelogue reasons, I’m going to talk about it as if the $22 optional GPS mount were part of the deal. If you’re smart, it will be. Read our full review. 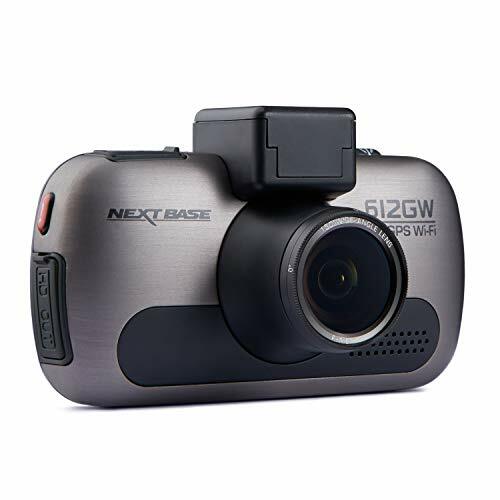 12-volt power: All dash cams use 12-volt power sources, and the majority of them grab it from the auxiliary power outlet (also known as the cigarette lighter). But that power disappears when you turn your car off. Outliers like the Owl and PureCam use OBD-II connector for constant 12-volt power, and OBD II to USB power cables are now available separately as an alternative to hardwiring kits that draw constant 12-volt power from the wiring harness. Battery power: A battery that will keep the camera recording after an accident is important if you want to be sure you record an entire incident when 12-volt power is lost. If run time is sufficient, it also allows you to record for a while with the car turned off. Supercapacitors, though they may sound like an improvement on batteries (in terms of recharge cycles and operating temperatures they are), don’t offer much recording after the fact, and in some cases—none at all. Continued recording when power fails so that you can be sure to capture all of an incident. This requires a battery or large supercapacitor. The camera should have a setting that allows you to set how long the camera runs off 12-volt before shutting down. A decently wide field of view: You’ll see cameras with as little as 90 degrees’ field of view, but you’ll catch more of what’s around you if you go for 120 to 140 degrees. Some cameras offer 160 to 180 degree lenses. Note that the wider the field of view, the more fish-eye distortion there is, and more processing is involved to compensate. MicroSD card storage. Pricier dash cams bundle a storage card. Some come with larger cards, and some budget models come without. There are often bundles available with the card. One camera, the Owl opts for hard-wired internal storage. GPS: This feature could be the tipping point if you use your captured video to resolve a dispute. GPS should either watermark or embed your video with geographical coordinates,. GPS will also automatically set the time in better cameras. Parking monitoring: This simply means running the camera where you’re not in the car. We have reviewed cameras (VaVa) that have a battery large enough to monitor the car (at a reduced video frame rate) with the 12-volt turned off. But most cameras require that you hardwire to a constant 12-volt source. Dual-channel support: This is what you’ll need if you want to run both front and rear (or interior) cameras, though it’ll involve more cabling (and cost more overall). Only a few models we’ve tested have it: The Thinkware F770 (available on Amazon), for instance, though the rear camera costs an additional $80; and the Cobra CDR 895 D Drive HD (available on Amazon), which gets you into dual-channel video for a measly $200—rear camera included. Few people are as well situated geographically as I am to test dash cams. Within two blocks there are major four- and six-lane thoroughfares, numerous bike lanes, joggers, dog walkers, oblivious ear-budded pedestrians, and a major bus nexus serving both public and private coaches. The opportunities for near-accident are endless. For every dash cam, I mount it in my car, judging the ease and convenience of doing so. Tip: Many dash cams rely on adhesive for mounting to your windshield. Hot conditions can make it next to impossible to remove the film that protects the adhesive. Remove the film in a cool environment, or place it in the fridge for a minute or two before installing it. I put each dash cam through several days’ and nights’ worth of driving, recording video and judging the image quality. All the dash cams I’ve reviewed in the last couple of years take good daytime video. However, night video is often plagued by murky shadows and headlight flare. That said, quality is improving rapidly with the introduction of new sensors. Take a close look at the night shots in each review. I try all the features: Buttons, display controls, apps. Aside from rear-view support and GPS, the most salient differences between the products are the interface controls and extra features, such as the lane departure and collision warnings that you get with some models. I try them...and I turn them off. In practice, they usually tell me I’m changing lanes, in heavy traffic, or have just been cut off. Additionally, the collision warnings generally come too late to do anything but distract you at exactly the wrong time. The most pertinent improvements as of late are HDR support (High Dynamic Range, for greater detail and contrast) and the aforementioned better night video processing. A warmer color palette is also apparent in many newer cameras. Some cameras definitely stand out, but nearly all the dash cams I’ve seen will capture sufficient detail during any daytime metal-on-metal encounters you’re unlucky enough to experience. Again, pay attention to the night video shots—that’s the big differentiator. Dash cams have plenty of room to evolve. As nice as dual-channel is, there’s talk about true 360-degree video. Check out TechHive’s review of PowerDVD 16’s 3D playback to see how compelling that can be. As I predicted at last writing, someone finally produced a dash cam that uploads to the cloud when an incident occurs—the Owl Car Cam. Additionally, it hard-wires by default to the OBD connector for easy-install, 24-hour surveillance. It has some foibles, but read the review—it’s the wave of the future, at least for the high end. 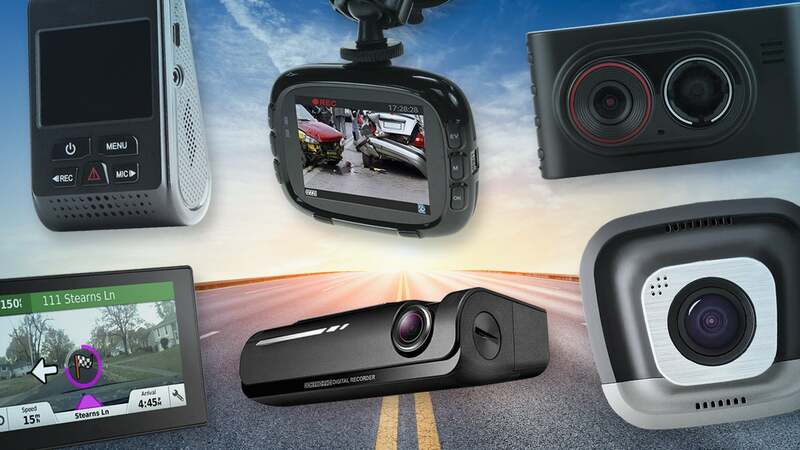 See the list below for details on dash cams we’re reviewed that are currently available, and check back for reviews of new products in this ever-expanding category. Small, easy to use, and with absolutely sterling day and night captures, this is one of, if not the best budget dash cams we've tested. It even has a real battery to capture events if the 12-volt is interrupted. Great stuff, but spend the extra $22 for the GPS mount. You'll thank us in the long run. This dash cam's superior night vision is in a class of its own. Feature laden, its only real drawback is price--$300 alone, and over $400 with a rear camera. Some users may rue the lack of a display, but overall, the F800 is a contender for best dash cam in the universe. With excellent video, ground-breaking features, and clever design, first-time vendor VaVa has jumped to the top of the dash cam heap. With GPS, this front/rear dash cam combo would've been an Editor's Choice. The stylish front unit with its marvelous touchscreen/interface is still our favorite physical unit, and the video from both front and rear cameras is top-notch. We favor GPS both for legal safeguard and travel-mapping, but if you just want style and great video, the T4 is it. VaVa's Dash Cam 2K improves video captures, while retaining the original version's clever rotating design. There's no integrated display, so the Dash Cam 2K is for phone-centric users only. With Alexa, a dash cam, and a constant eye on the road, the Garmin Speak Plus has enough bells and whistles to justify its $200 price tag. Audible prompts let you know when you swerve or tailgate. Alexa integration lets you get directions and control smart home devices. High-quality recording lets you keep an eye on the road. Lengthy cable is difficult to hide. The device doesn't work unless your smartphone is in the car. Navigational cues are a little off. 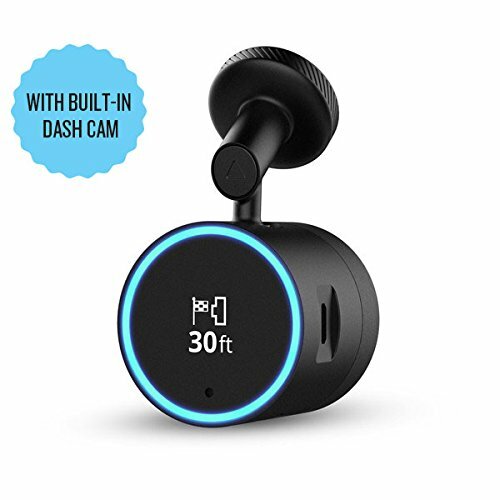 This dash camera has a clever, compact, and handsome design, with lots of high-end features such as voice control and Wi-Fi connectivity. It also provides traffic light and speed trap alerts. The 180-degree wide-angle lens captures details to the side, but does suffer some fish-eye effect. Video stabilization could be better as well, but it's still a very nice camera overall. The F800 Pro's night captures are by far the best we've seen, both front and rear. But the system is too reliant on your cell phone for the new cloud connectivity and a few other features. 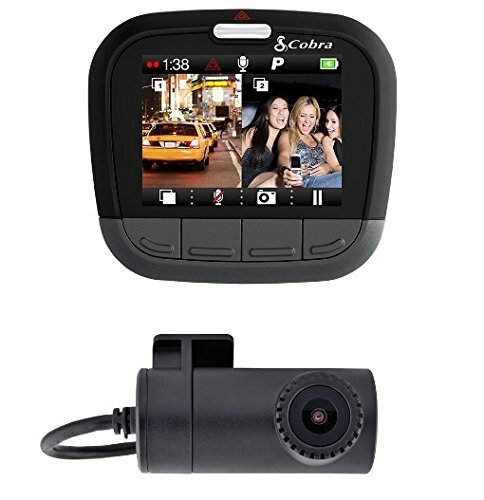 The Blackvue DR750S-2CH offers excellent day and night video from both the front and rear cameras. The configuration and viewing app is top-notch, as is the GPS-savvy viewer for the PC. While it lacks extras like driver aids, it's otherwise one of the best dash cams we've reviewed, though unfortunately also one of the most expensive. The c550's video captures are surprisingly good--both day and night. But the rear camera is primitive in quality and design, and the $13 GPS add-on doesn't watermark the video. Also, only the latest versions will record after 12-volt power is removed and then for only 10 seconds. Still, the price is tempting, and if you think of the unit as a single camera, it's competitive. If you're more interested in keeping track of what's going on inside your vehicle than what's behind, the DrivePro 520, with its integrated interior camera, could be just what the doctor ordered. Uber and Lyft drivers take notice. This is the best dash cam for catching events in the periphery. The interface is subpar, but the features are top-notch. The V1 looks inexpensive at $100 until you realize it'll cost you another $30 to get the GPS everyone should have. Exceptionally steady daytime capture is the best feature of this bare-bones model. 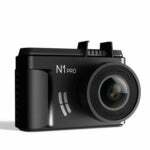 This is a nicely designed dash cam with a clever magnetic mount and a very nice feature set. Garmin also knows dash cams—every setting and tweak required is in place, including integrated GPS. However, night video isn't up to current standards, and bumps aren't stabilized in video very well. There are significantly cheaper cameras with better video. Opt for the nearly identical, albeit pricier, Garmin Dash Cam 55, which offers significantly better captures. The Viofo A119 is a real bargain, with surprisingly good video for the price, and a boatload of features. GPS is just a $10 add-on. The trade-offs: no SDHC card included, and the device is not removable. The Yada shows you don't have to spend a fortune to get an effective dash cam, but it has a few significant limitations. The Aukey's DR01 product features great video captures, day and night. It also supports GPS via a $20 external module, though said module often took minutes to initialize and start watermarking the video. But the camera stops recording the second it loses power, a potential problem in accidents where 12-volt power is cut off.